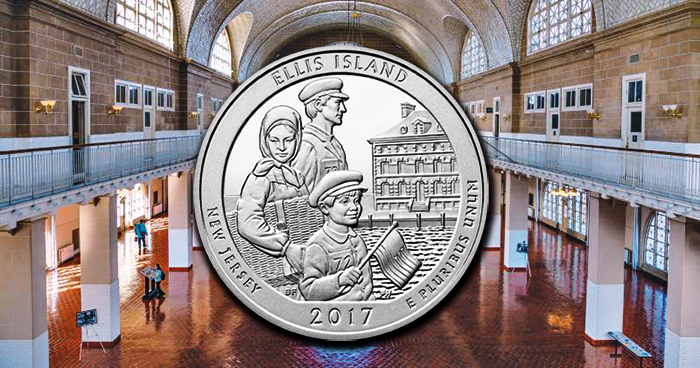 The United States Mint will open sales for products featuring America the Beautiful Quarters® Program coins honoring Ellis Island starting on August 28 at noon Eastern Time (ET). The coin’s reverse design depicts an immigrant family approaching Ellis Island with a mixture of hope and uncertainty. The hospital building can be seen in the background. Inscriptions are ELLIS ISLAND, NEW JERSEY, 2017, and E PLURIBUS UNUM. The reverse was designed by Barbara Fox, Artistic Infusion Program designer, and engraved by Phebe Hemphill, United States Mint sculptor-engraver. The obverse design features the 1932 portrait of George Washington by John Flanagan. The special numismatic wrapping for the coin rolls displays the name Ellis Island; the abbreviation NJ for New Jersey; $10, the face value of its contents; and P, D, or S for the mint of origin. The canvas bags have a tag with Ellis Island, NJ, and P, D, or S.
Orders will be accepted online at the website of the United States Mint or by phone at 1-800-USA-MINT (872-6468). Hearing- and speech-impaired customers with TTY equipment may order by calling 1-888-321-MINT (6468). Information on shipping options is available here. The United States Mint was created by Congress in 1792 and became part of the Department of the Treasury in 1873. It is the nation’s sole manufacturer of legal tender coinage and is responsible for producing circulating coinage for the nation to conduct its trade and commerce. The Mint also produces numismatic products, including Proof, Uncirculated, and commemorative coins; Congressional Gold Medals; and silver, gold and platinum bullion coins. Its numismatic programs are self-sustaining and operate at no cost to taxpayers. The Mint is celebrating its 225th anniversary this year (#USMint225).